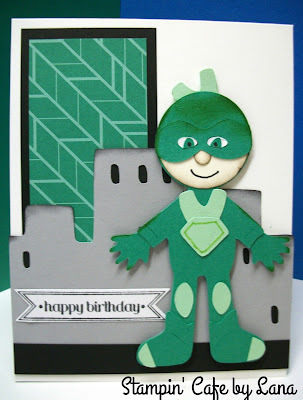 Stampin' Cafe by Lana: Super Hero Cards "P.J. 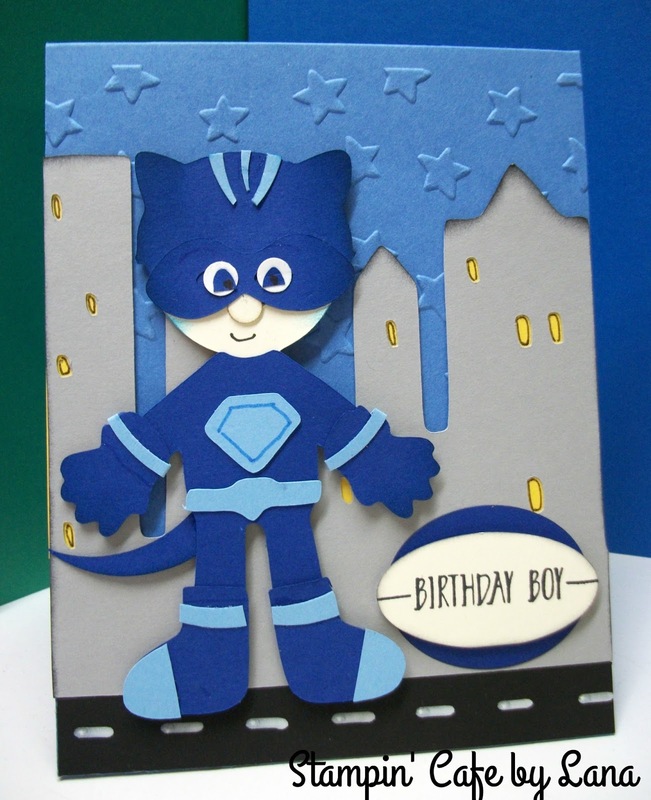 Masks"
Super Hero Cards "P.J. Masks"
My granddaughter is a BIG fan of P.J. Masks! While these cards are not exact duplicates of the Catboy, Gekko and Owlette characters, they are close enough that my granddaguther was excited about them! They were all made using the Paper Dolls Dress Up Cricut cartridge, plus I also used the Create a Critter cartridge for Cat Boy and Owl Girl's heads. All card bases are the same, 4-1/4 x 5-1/2 inches, top folding. I will try to give you as much detailed direction as I can so you can recreate these characters. There is a lot of piecing and trimming involved, but with a little time and patience, you can make these cute little characters for a P.J. Masks fan in your life! If you would rather purchase a PDF of these directions, I have separate digital PDF files for each character/card at a nominal cost at my Etsy Shop - Stampin' Cafe by Lana. This makes it easier for you to download it instantly and not have to contact me and wait for a response. 1. Cut a Paper Doll body from ivory cardstock, at 4 inches, p. 29, Paper Doll Dress Up cartridge. 5. Cut head from Create a Critter cartridge, cat2 on p. 38, at 1-3/4 inches.. Trim as needed to fit head of paper doll. 6. The light blue accent pieces on head, sleeves and boots will need to be hand cut. You can cut the boots out again in the contrasting color and cut off the boot tips to make the contrasting boot tips. 7. Cut a tail using a 2 inch circle punch and attach to back of doll. 8. To make eyes, punch 2 circles with a 1/4 inch circle punch. I used one of the inside cut-outs from the mask to make the eyeballs, cut in half, and made black dots with a marker for the pupils. 9. Nose is a 1/4 inch circle punch. 10. Cut out background building at 4 inches, p. 56. Trim to fit the card. Add yellow pieces behind window openings for lights. 11. I used a star embossing folder from Stampin Up to emboss the card base. 12. Black strip was added at the bottom to resemble a street. 13. Greeting is from a retired Stampin' Up Sale-a-Bration stamp set called "Hello." 2. Cut the costume at 4 inches, p. 56. 3. Cut mask on p. 56, once in green and once in white. 4. Cut boots and V-neck for costume, p. 57. Cut the V-neck twice in a lighter color green. The second cut will be for the head piece. 5. Hand cut knee patches and toe pieces, or cut boots out a second time in the lighter green and rim off the toe portion. 6. For the face, punch out a 1-3/4 inch circle, cut in half. Nose is a 1/4 inch circle punch. 7. For the eyes, take the white cut-out pieces from the white mask and insert those into the green mask for the eyes. Take the green cut-outs from the green mask, cut in half, and add to the white pieces for eyeballs. Use a black marker to make dots for pupils. 8. Use what is left of the building you cut out previously for this card, adding black behind the windows, or use yellow for lights. 9. 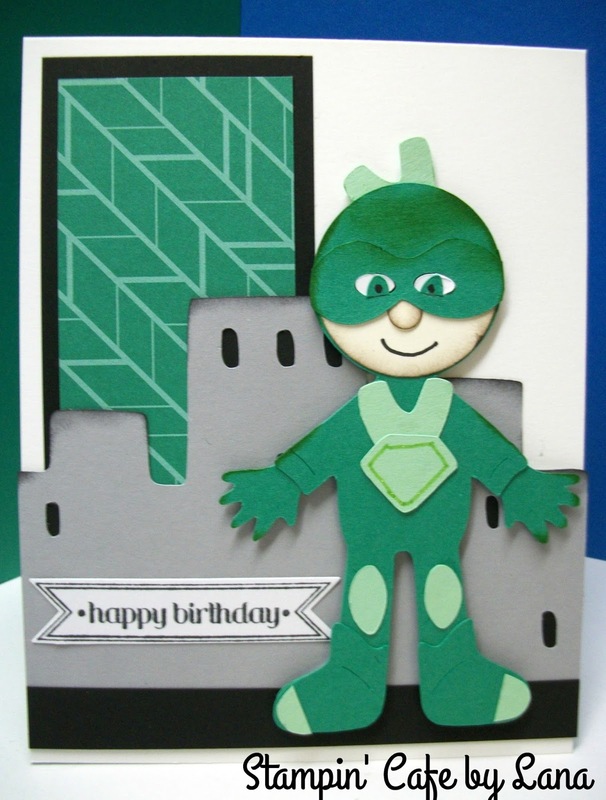 The green geometric paper used on the card is envelope paper from Stampin' Up in Emerald Green. I also used Emerald Green for the character. 10. Greeting is from a retired Stampin' Up set called "Itty Bitty Banners." 1. For this one I did NOT cut out a paper doll body. I cut the Supergirl costume at 4 inches, p. 57. 2, Cut owl on p. 25 of Create a Critter cartridge at 2-1/2 inches. Trim to form more pointed ears and round the bottom to form the head. 3. Add a 1-3/8 inch circle, cut in half, to form the face. Add a 1/4 inch punched out circle for the nose. 4. Add a 1-3/8" circle in the same pink color behind head/ears to form rest of head. 5. Cut mask and emblem, p. 56. Cut mask a second time in white. 6. Punch out a flower in a coordinating pink color of a different shade (I used Rose Red for the body and Melon Mambo for the wings) to form the wings. Cut in half, trim as needed, and attach to back of body and behind arms. 7. Attach mask to face, Insert white cut-outs from white mask to make eyes. Use one of the cut-out pieces from the pink eye mask, cut in half, to form the eyeballs. Use a black marker to make the pupils. 8. Punch out a small white heart to attach to the emblem on her chest. 9. Fold legs back to resemble a flying motion. 10. Cut buildings on p. 56 at 2-1/2 inches and trim to fit card front. Attach white pieces behind windows if desired. 11. 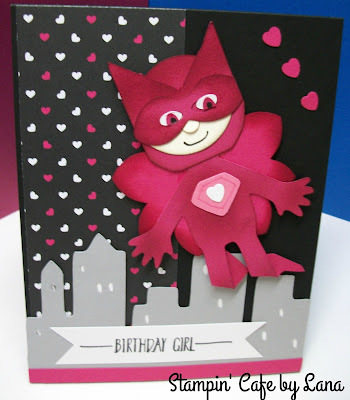 The heart paper is Pop of Pink DSP by Stampin' Up. 12. Greeting is from the Hello stamp set, a retired SAB set from Stampin' Up. 13. I added a piece of the same pink color (Melon Mambo) to the bottom of the card below the buildings and the greeting, and attached small pink punched out hearts to the upper righthand corner. Well, there you have it. I realize this is a long post, but I hope I have enough detail for you to make your own super hero characters. There was a lot of trial and error involved, so if I can save you some of the error, that is a good thing! Have a good week. I will be back next week with a new fall card for you!